1869. 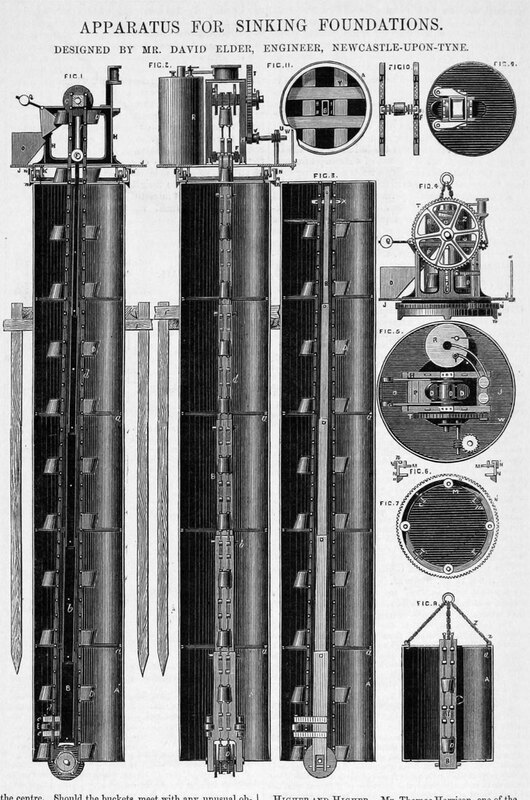 Apparatus for sinking foundations. 1785 Mr. David Elder was born at Little Seggie, near Kinross. His father Alexander Elder was a counry millwright and constructed ploughs. Had an early great aptitude for mathematics. He studied the principles of mechanics and hydraulics by watching the working of old water-wheels in the mills in the district. 1813 He moved to Glasgow and got employment at the dye works of Mr. Glass, at the spout mouth. He then worked for Mr. Carsewell as a joiner and then Mr. Leitch a cabinet aand weaving implement maker in Paisley. Then he worked for James Dunlop, one of the pioneers of the cotton manufacture in Scotland. He designed and oversaw the erection of a new cotton mill at Broomward. 1814 Employed by J. Clarke and Co of Paisley. 1817 went to Glasgow to practice as a mechanical engineer and millwright. Employed by James Dunlop in the erection of Broomward Mill. Designed a machine for stamping spoons for Mitchell and Russell. 1821 became manager of Robert Napier and Sons engineering works at Camlachie. c.1822 Napier, having contracted for his first marine engine for the steamer "Leven", gave the work to Elder. Many of the difficulties connected with the early manufacture of marine engines were overcome by Elder's ability and resources. 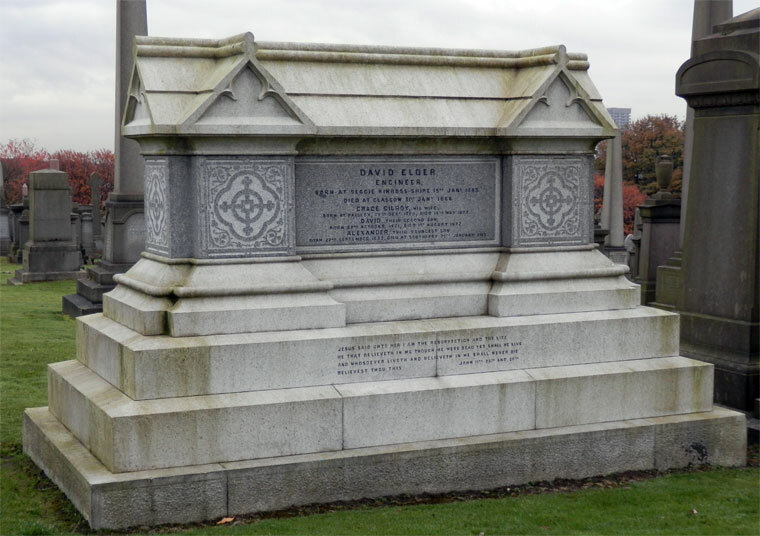 1824 His son, John Elder was born in Glasgow, on the 8th March. 1826 The first double engine, designed by Mr. David Elder, was for the "Eclipse," although it nearly killed him when he started the engine. Elder gave a great deal of attention to the framing and fastening of the middle part of a ship, which avoided the problem found by some competitors in that vessels which broke their engine frames because of the bending and twisting of their hulls. He introduced wrought iron to replace cast iron for framing. 1866 Obituary on page 256 give details his achievements at Napier's. This page was last edited on 1 September 2014, at 14:42.